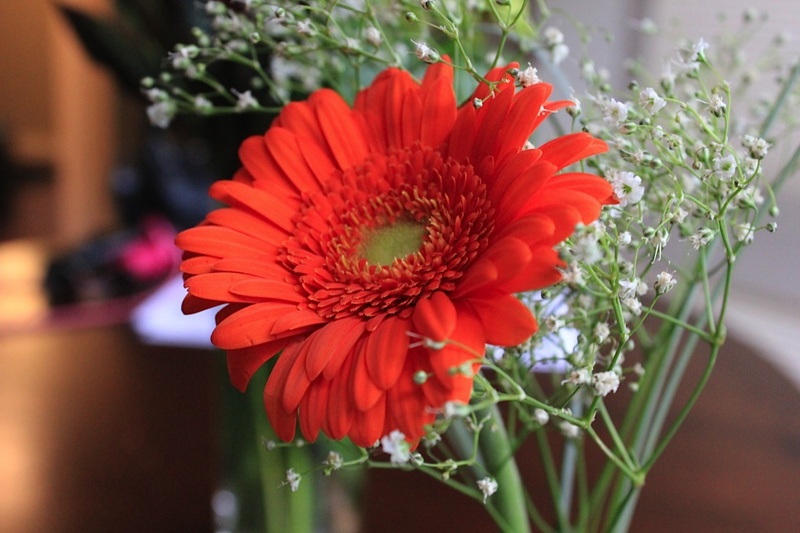 While grocery shopping I always like to go to the flower section and enjoy the different flowers they have on display. Sometimes if there are really pretty ones or some on sale I'll grab a few to take home. As I mentioned on my cute cube post I bought a couple of flower bouquets from Soveys a few weekend ago. 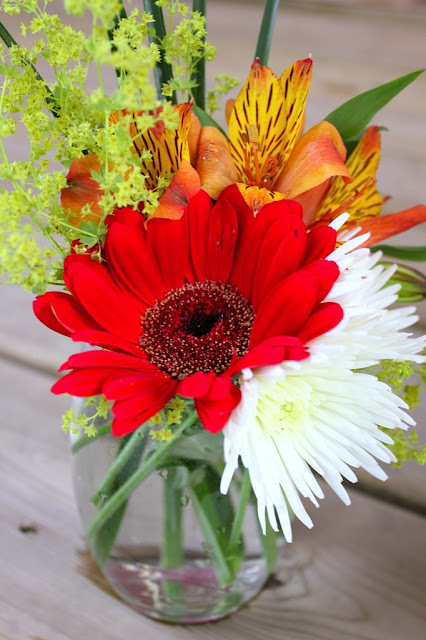 I took flowers from both bouquets to mix and match and make a few arrangements around the house. 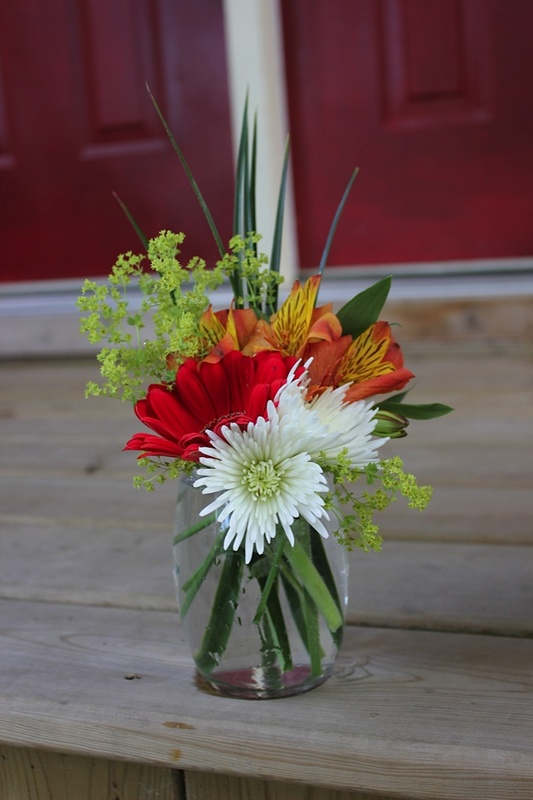 I mixed and matched the flowers and foliage from both bouquets bought at Soveys to make four different arrangements. 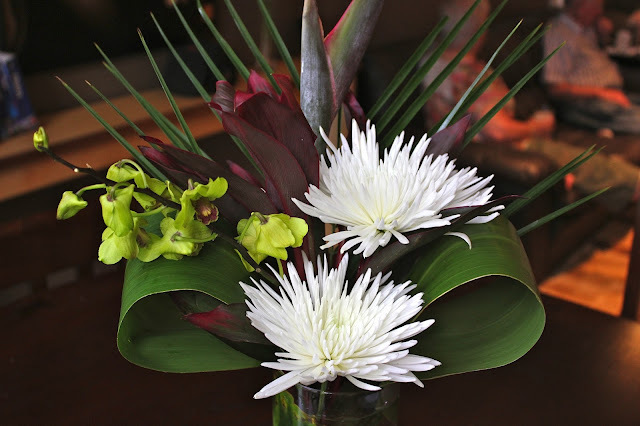 I also used the green orchid and zebra leaf that I had previously used in my post of orchids. 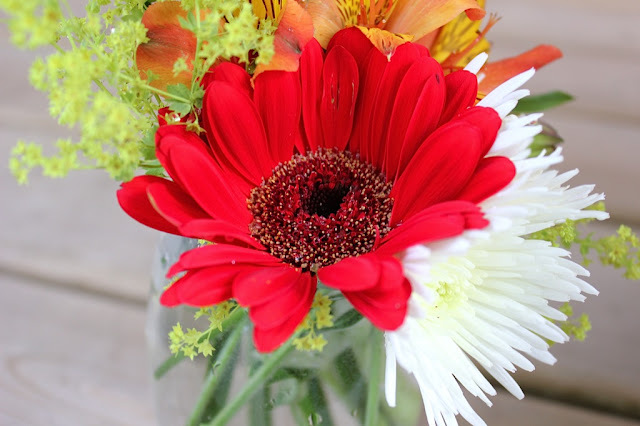 Each bouquet cost $14.99 so I spent $30 in flowers to make beautiful arrangements for the whole house. Bouquet contained carnations, spider mums, orange and yellow flowers (don't know name), orange daisies and some greenery. 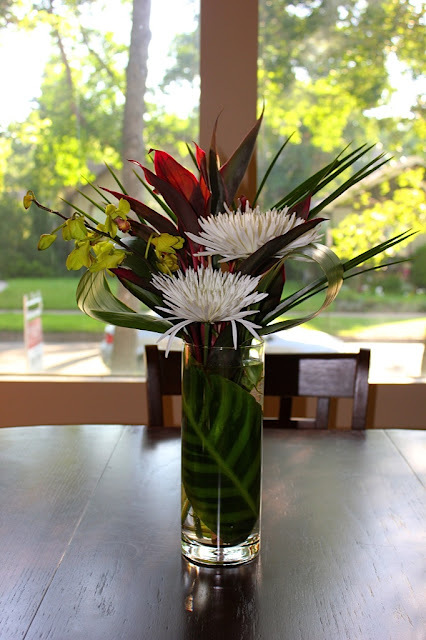 Bouquet contained beautiful foliage, bird of paradise, lilies: yellow and pink, and a beautiful red carnation. Also some weird looked pine cone thing that I threw out because it looked like it was wilting. For the bigger arrangement I took one of my big round vases bought at the dollar store for $2.00. I used the zebra looking leaf that came with my orchids I had bought a week earlier to line the inside of the vase. I then cut up the big green tropical leaf (don't know the name) to the proper length I wanted and I also removed some of the pieces that would have folded up inside the vase. I placed it in the vase and added the beautiful purple leaved stem (also don't know name) and bird of paradise cut to proper length. I then placed the big green leaves folded up in each side, making a frame for the purple leaves. I cut up the two big spider mums and placed them in beside each other at different heights to create dimension. I added the green orchids last to add that extra bit of color and sass. Cut pieces used in second arrangement. I used the cut up pieces from the tropical leaf in the second arrangement, added the pretty red daisy, orange and yellow flowers, tiny white spider mums that were part of the branch and the green little flowers all cut the proper size. 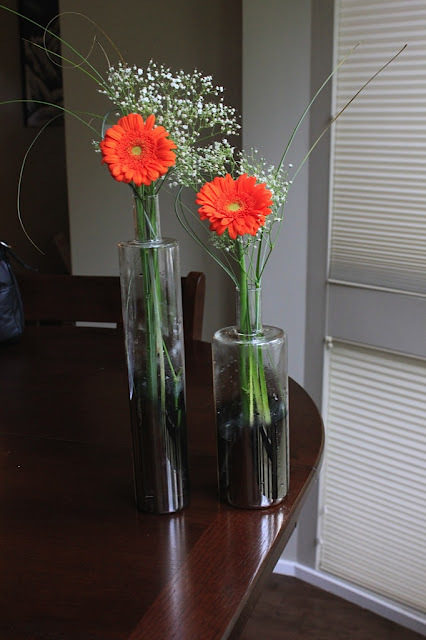 For the third arrangement I took just the orange daisies with some baby breath and grass I still had from a previous arrangement and placed them on my pretty contemporary vases. The forth arrangement was already featured in the cute cube post. You can check it out at http://www.thesassypetal.com/2012/07/cute-cube.html. 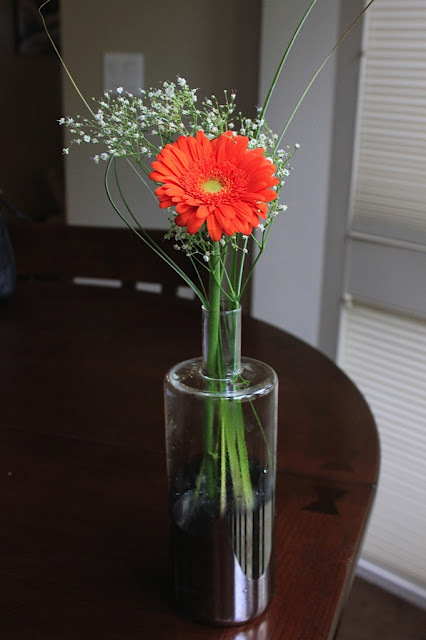 The lilies that came in the bouquet were not in great condition so I just took the best two flowers and added them to a simple drinking glass with some baby's breath and placed it on my nightstand. I really enjoyed creating all these arrangements with the two bouquets. I had to use what flowers I had at hand and I think they all turned out really pretty. The yellow and orange flowers are called alstroemeria. They're sometimes called princess lilies and they last forever. Lovely job with the flowers! Thank you so much for letting me know the name.